This throwback comes with a backstory. A backstory I still feel guilty and shameful about. China Glaze No Way Jose was my biggest nail polish wishlist item for a long time. It's from a 2006 collection, and I saw it on a few blogs when I started blogging in 2010. This polish was long gone polish history though. It was impossible to find. In 2011, near my birthday, I happened to come across it on eBay. It was the first bottle I had seen after searching for 2 years. I was determined to get that bottle of polish. I bid on it. I was outbid. I kept bidding. I won the auction at $36. I felt like I won the lottery. The next day something really depressing happened. The same seller I won that auction from, put up 10+ bottles of No Way Jose with starting bids of $10. There was only one bottle listed at the time I bid. No other bottle since mine has sold for probably over $15. The same seller still has more bottles of No Way Jose. That is the most I've ever spent on a bottle of nail polish and ever will. Was it worth the $36 dollars...? 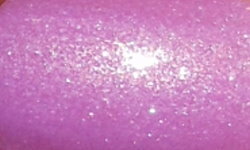 No Way Jose is a soft lilac with a soft glass fleck shimmer/glitter. Color: This color isn't entirely what I had expected. I wish it was more pigmented and bit more blue toned. That's not to say it's not pretty. It's a beautiful color and that glass fleck glitter is stunning. It's just with my skin tone this color doesn't really stand out and blends in with the pinky tones of my skin. Formula: This formula is sheer, but buildable. I used 4 coat above. This applied easily. Price: The same seller I bought it from for $36, 4 years ago has it now for $8.95 "Buy It Now" on eBay. Overall: Was it worth $36? Definitely not. It's a pretty polish, but knowing that seller was just testing the waters and really had the entire world's stock on No Way Jose to make a chunk off cash on me leaves me bitter. I know better now for sure, and realizing the color clashed with my skin tone leaves me very disappointed and unimpressed. Again, not a bad polish, but I'm just bitter. I don't blame you for being bitter-- I would be bitter too! It's a pretty color, but I don't think it's $36 pretty! I quite like it but so expensive! I have the whole Tequila Toes collection and all those from the collection that was the one with all the internet acronyms that was so sought after even when that collection came out - I guess since I am not into my polish that much I need to get those all out, long with all my early OPI DS polishes and a few others and list them on ebay - it's time they all go to a deserving home that will love them - I never used any of them! Oh and for all those sort of critical about how this was a lot of $$ to pay for this polish - the holos and the real great glittery shimmers (remember this was before all the glitters hit like the DL Happy Birthday that set the world on fire) -- times were different back then - no one was making indies and no one really had spectro-flair to add to polishes or really knew how to achieve a lot of the finishes we take for-granted now. I hate to hear that story, but I do love this color and finish...I also got this from ebay and I don't think I've worn it, shame on me!